rekordbox wins iF DESIGN AWARD for enabling DJs to create multisensory entertainment spaces through sound, light and lyrics. For the second year running, our DJ application rekordbox™ has won one of the most sought-after prizes in the industry – an iF DESIGN AWARD. rekordbox enables you to create new multisensory entertainment spaces through sound, light and lyrics and it’s been honoured in the iF DESIGN AWARD 2019 Service Design/UX category, which recognises not only product and application design but also user experience as a whole. This follows last year’s win for rekordbox, when its simplified GUI earned a prize in the Communication - 3.02 Apps/Software discipline. Now in its 66th year, the prestigious iF DESIGN AWARD 2019 is one of the most significant prizes a product can receive, acknowledging creative excellence from across the globe. As well as offering traditional music and video performance capabilities, rekordbox empowers you to easily sync visuals thanks to two innovative features added in 2018. The first, rekordbox lyric, is the world’s first DJ tool that harnesses the emotional response lyrics induce by syncing with music and projecting lyrics on-screen. The second, Lighting mode, enables you to easily develop sophisticated lighting displays. These innovations were evaluated by 67 design experts from around the world and we’re incredibly proud to have received the prize. 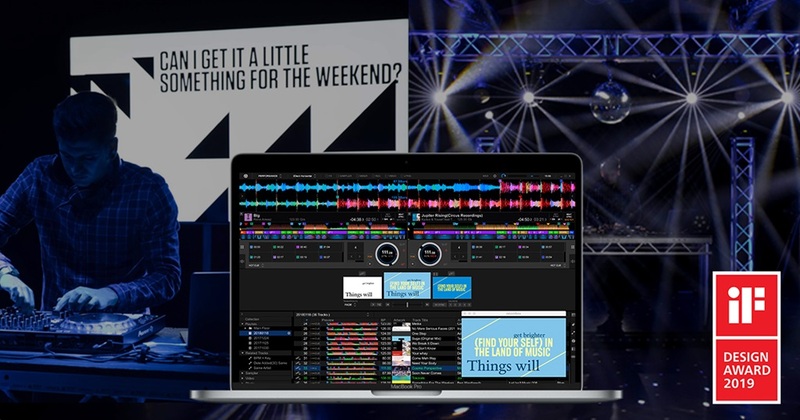 rekordbox is a DJ application that supports all aspects of DJ Life, from preparation to performance and feedback. Many DJs around the world use rekordbox for free. Lighting mode enables you to easily sync lights with your music during performances. It automatically creates exciting lighting sequences tailored to the tracks in your rekordbox library, drastically reducing pre-performance preparation time. rekordbox lyric displays animated visualisations of track lyrics on the fly via monitors or projectors. You can even customise font colour and transparency of the background individually to match the crowd’s vibe. For 66 years, the iF DESIGN AWARD has been recognised as an arbiter of quality for exceptional design. The iF label is renowned worldwide for outstanding design services, and the iF DESIGN AWARD is one of the most important design prizes in the world. Submissions are awarded in the following disciplines: Product, Packaging, Communication, Service Design/UX, Architecture and Interior Architecture, as well as Professional Concept. All awarded entries are featured in the iF WORLD DESIGN GUIDE and the iF design app, and are displayed at the iF design exhibition Hamburg.